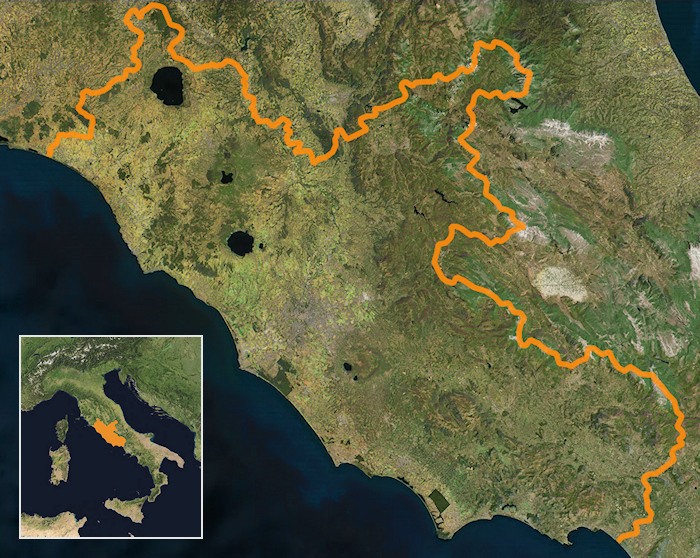 Lake Martignano lies about one hour’s drive to the north of Rome near its larger sister, Lake Bracciano. 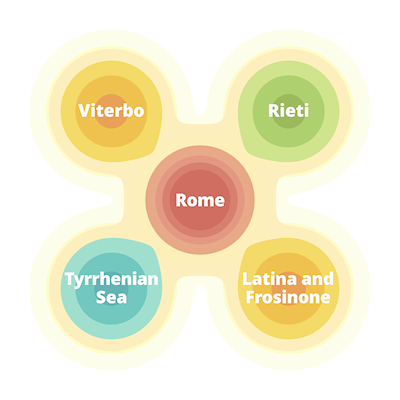 Both lakes are volcanic in origin and if your flight path into Rome’s Fiumicino airport takes you down the backbone of mainland Italy from the north, you will see them about five minutes before landing. Incidentally, the same route will also take you over Lake Bolsena, about 20 minutes earlier. Lake Martignano is a great favourite with slightly more eco-and alternative-minded locals who wish to avoid the more organised and crowded Lake Bracciano. 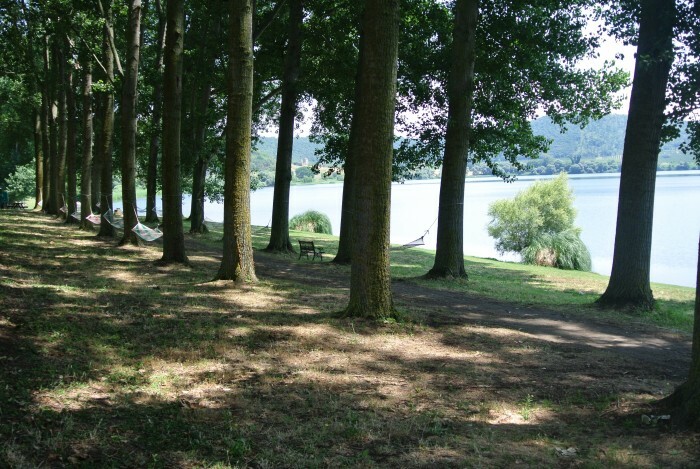 Despite its slightly laid-back “Freak Lake” image (more in evidence at the public beach) It still offers more than enough essential facilities for an enjoyable day out, including easy swimming, pedalos, canoes, bars and basic toilets. A car is really a must for a visit to this lake. The easiest option is to drive to a privately-run agriturismo, Il Castoro. Here you can park for free outside the agriturismo and then pay an admission fee of €5 per person, This buys you the run of the private lakeside area, including restful hammocks swinging between the trees. There is a very pleasant rustic restaurant overhanging the water’s edge, where you can buy very reasonable barbecued meat and other dishes suitable for vegetarians. 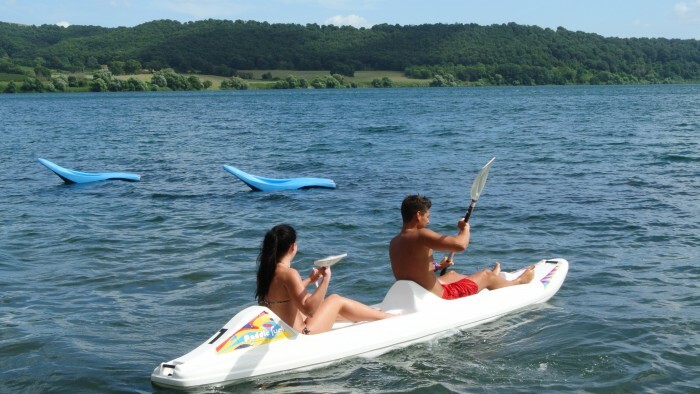 If you want to do more than relax on the shore, eat and swim in the soft lakewater, you could always hire a canoe or pedalo: you will need to leave a document as a deposit. 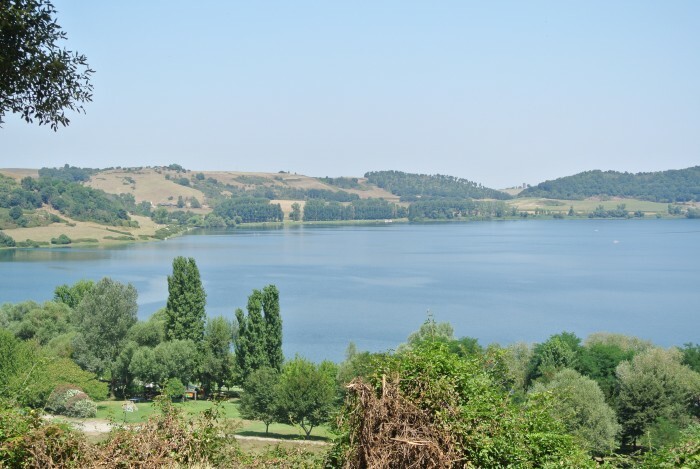 The other more intrepid option for visiting Lake Martignano is to get down with the locals and go to the public beach operated by the Anguillara town council. To do this, you will need to drive toward Angiullara but take a left turn before reaching the town, following the one-way system. 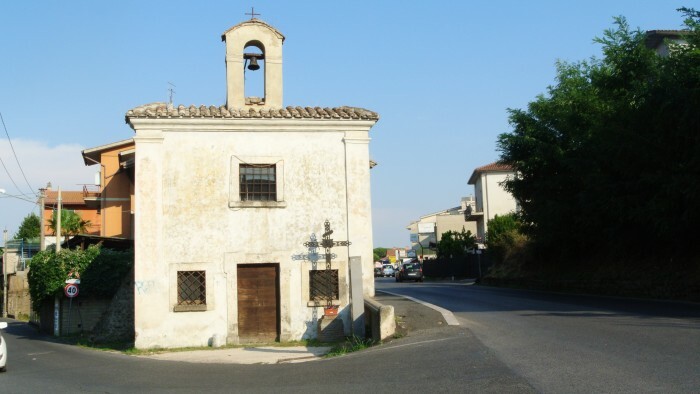 Then at the first T-junction, turn left and continue until you see a small church (shown below). Fork left at this point. 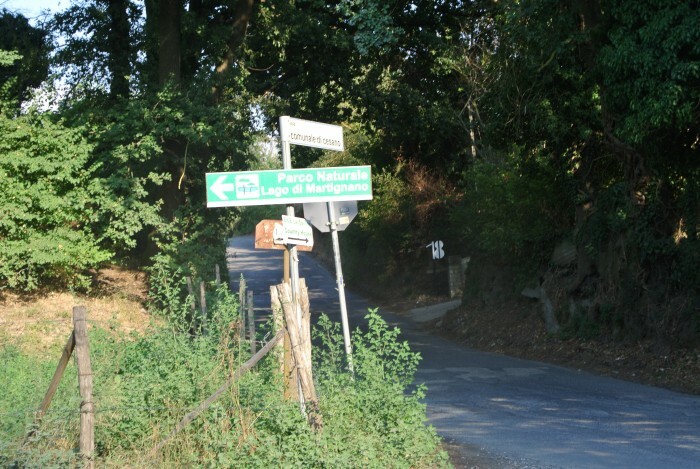 Then follow the green signs to Lake Martignano. Eventually you will reach a car park where you can take a shuttle bus down to the lakeside (it used to be possible to drive down to the lake but the council has introduced the new scheme to minimise erosion). The car park costs €3 to park all day and the shuttle bus cost €1 per person (keep your ticket because it is also valid for the return trip). The bus leaves you at a point where you have to walk the last 15- minutes or so down to the lake shore. The path is good but there are loose stones and it is steep in places, so wear good footwear. The public beach is larger than the privately owned beach on the other side of the lake and has correspondingly more facilities: a couple of bars plus pedalos and canoes for hire and also basic public toilets. Dogs are welcome and at our last visit quite a few were enjoying themselves in the water with their owners. An unexpected treat at my last visit was also a visit to the bar or chioscho furthest away from the point of arrival on the lake shore. Here is a link to its Facebook page Lucignolo Martignano, which gives a good flavour of life on the lake. 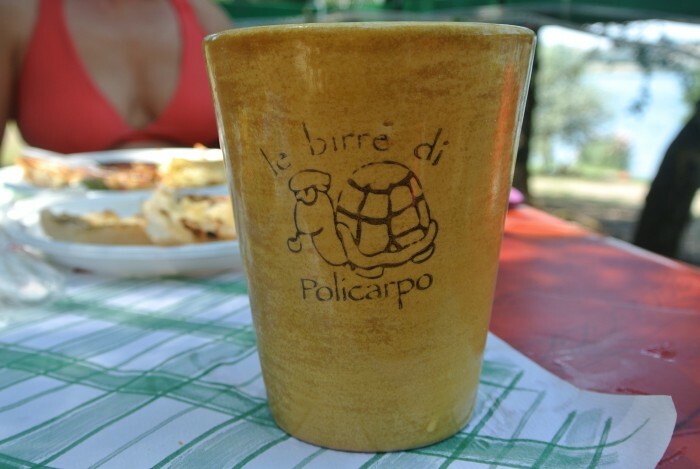 The tremendously enthusiastic owners Massimiliano and Antonella persuaded us to try a couple of extremely tasty artisan beers by the Policarpo microbrewery, apparently run by two sisters and part of Italy’s new and exciting craft beer scene. An appetising selection of food, including vegetarian options, is on offer at the chiosco, some barbecued on the grille. After a couple of beers, we were also delighted to find that Massimiliano operates a private shuttle service up to the car park, allowing you to avoid the the slog back up the hill to catch the council-operated shuttle minibus. As you leave the lake at dusk after an idyllic day on the verdant shores, you may see some people arriving for a night of wild camping under the stars.